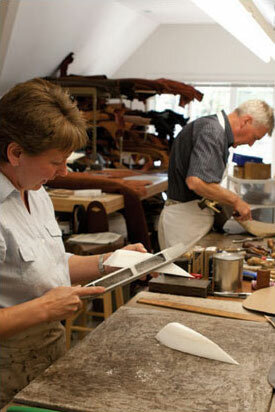 Master craftsmen David Stackhouse and Lesley Ellis individually create each saddle to fit both you and your horse. All of the leather is cut by hand, allowing for the flaps to be tailored to the individual rider. Tacks, screws and hand stitching ensure that the saddle will withstand the rigors of many years of use. The finest vegetable tanned, full grain leather is used in the flaps, in conjunction with top quality Buffalo, French calf and English hides. Over the years many riders, amateurs and professionals alike, have recognized the importance of a saddle with perfect balance. This perfect balance is achieved by combining the correct fit with a properly constructed seat. We carefully measures both horse and rider in order to create the perfect fit. Each flap is cut to the rider’s requirements. Quality, comfort and fit are just a few of the many things to take into consideration when purchasing a saddle. Stackhouse saddles are truly custom made. We do not carry any saddles in stock. We have an average of two hundred saddle trees in stock and an extensive selection of leather. Cosmetic choices, color, style, thickness of knee pads, type of keepers etc., do not alter the cost of the saddle. Please browse our gallery to see some of the options that we have to offer. As a young man living in Walsall, England, the center of the English saddlery industry, David Stackhouse was drawn to the work of master saddlers. He completed a six-year apprenticeship at one of the worldâ€™s most famous saddlery companies and was taught by a master craftsman who instilled in him the value of traditional methods. After completing his apprenticeship, Mr. Stackhouse started his own custom saddle company, initially supplying shops, but as his reputation as a saddle-maker grew, so did requests for custom orders. In 1999 Mr. Stackhouse moved to the U.S. to better serve the needs of his growing U.S. market. â€œOur customers are those who want the very best for their horses,â€ he says, noting that his individually-crafted saddles are owned and enjoyed by amateur riders as well as professional and Olympic riders throughout the world. Each Stackhouse Saddle exhibits not only his understanding of the saddleâ€™s function, but the best of traditional craftsmanship. Lesley Ellis is no stranger to horses; she grew up on farms in her native Bristol, England and as a youth enjoyed many memorable rides with the local Pony Club. She received training at the Warsall Leather Center, located in Warsall, England, a town internationally famous for its leather trade. She graduated as Student of the Year in 1992 and worked with a well-known Saddlery company making bridles and other strap goods. Yearning to pursue the true craftsmanship of saddle-making she joined master craftsman David Stackhouse in 1994. It was under his tutelage that she found her true worth and satisfaction as a saddle maker. Today, Lesley makes saddles as they should be made â€“ by hand. She carefully fits the horse and measures the rider to ensure that each saddleâ€™s balance is perfect. â€œIf the balance in the seat is correct and the saddle fits, the horse will be able to move freely and you will love the saddle,â€ she says.